HP ProOne 400 G3 All In One (AIO) Desktops are the perfect versatile and easy to deploy AIO business desktop for Small to Medium Size Businesses (SMBs) looking for the best in collaborative features! 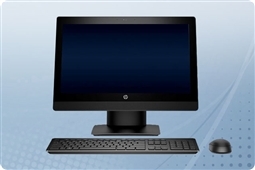 Built with features such as the HP Manageability Integration Kit and HP WorkWise the HP ProOne 400 G3 AIO Desktop speeds up image creation and management of your hardware, security, and BIOS as well as has office intelligence available from a user friendly mobile app, making deployment and maintenance easier than ever! In addition, the HP ProOne G3 All-In-One Desktop has collaboration ready features that make it easier than ever to create and be productive together! Enjoy features such as the 1MP HD Webcam, Skype for Business, HP Noise Cancellation Software for better call quality, and optional 10 point touchscreen display that allow you to maximize creative potential and all in one productivity. Plus, Aventis Systems has tons of customization options to choose from. Pick you perfect touchscreen or non-touch model, upgrade your DDR4-2400 memory up to 32GB, pick your high capacity SATA or high speed SSD for storage, and add your perfect business software taking this all in one HP desktop to the next level of complete plug and play deployment! All Aventis Systems HP ProOne 400 G3 AIO Desktop come standard with a 1 Year Essentials parts replacement warranty with upgrades to Secure Drive hard drive retention, Express NBD parts replacement, and Extended 2 Year term warranties available for more coverage. So check out our models below and build the ideal versatile and easily managed HP ProOne 400 G3 Desktop for better collaboration today!